I used to be a non-believer. Having read an article somewhere about the explosion of acupuncture services with no proven evidence that they even work, I’d dismissed it as just another fad. Then I met one of my now closest friends. She’s an accomplished Traditional Chinese Medicine (TCM) doctor with a lovely clinic in Charlotte. About two years later, after trying unsuccessfully to conceive for a few months, I reconsidered. My friend had a lot of success treating her patients’ fertility issues – maybe it would work for me? I was living in Norway at the time and sought out one of the few practitioners in our small city. He was a jolly Danish man who was also treating many women for infertility or as a complement to assisted reproductive technology. We did four months of acupuncture and reflexology and gradually I noticed an improvement to my menstrual cycles. By the end of January I was pregnant. At the time I was taking many of the wrong supplements (folic acid, cyanocobalamin, standard prenatal vitamins, etc.) because I didn’t know I had MTHFR gene mutations. My hypothyroidism was also under-treated. So I attribute the conception completely to TCM. Of course, that pregnancy wasn’t meant to be. I still had other things going on in my body that needed to be addressed and both I and my husband (who is homozygous C677T) were suffering from nutritional deficiencies because of our mutations. It would be another few months before we got to the root of our problems and could start correcting them. But after moving back to the United States I was eager to get back to acupuncture. Not only did I feel that it was beneficial to my reproductive system, I also got an indulgent stress release at every appointment. Lying there peacefully for twenty minutes or so, feeling the energy move around in my body, the heaviness in my body anchoring me to the table – an acupuncture session is almost like an out of body experience. It seriously feels that good. You will barely feel the needles going in so there is no need to be afraid of this centuries-old wellness practice. Those of us with MTHFR mutations often deal with chronic illness in our lives. Acupuncture has been shown to be beneficial in the treatment of pain management, hypertension (and here), fibromyalgia, depression, polycystic ovarian syndrome (PCOS), tension headaches and unexplained symptoms, among other conditions. It is even practiced at the Mayo Clinic. According to Dr. Randine Lewis, author of The Infertility Cure, “the health of the human body depends on maintaining balance within its different systems” (Lewis, p19). And thus TCM practitioners go about addressing the imbalances in the body’s energetic systems. Through a combination of herbs, acupuncture and dietary changes, the body is returned to a state of equilibrium (19). The approach is completely holistic and differs quite a bit from Western medicine. In my ideal world, these two forms of medicine would finally find harmony, with Western medical doctors learning more about nutrition, vitamins and the mental states of their patients. I find that I just cannot get it all in one place these days. If I have a health issue, I now consult both my regular doctor and my acupuncturist and form a synergy between the two opinions. I’ve found a lot of support for my adrenal fatigue through acupuncture, since working on the Kidney system also assists with the adrenal glands. My husband goes for pain management with a condition he has affecting his neck and spine, along with general reproductive support. Should you be dealing with a chronic condition like arthritis, sinusitis, anxiety, indigestion, asthma, addiction, insomnia or headaches (there are many more diseases that TCM can assist with), perhaps acupuncture is something that you would like to consider? I especially recommend this therapy for those dealing with hormonal imbalances and/or infertility as this is the area where I have had the most personal success. 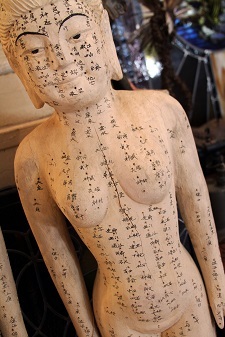 For resources and further information on acupuncture, check out these guides from the National Center for Complementary and Alternative Medicine, the American Academy of Medical Acupuncture and the Alternative Medicine Foundation. The American Board of Oriental Reproductive Medicine (ABORM) website lists practitioners in the United States, Canada and Australia who have an advanced certification in both Western and Oriental Reproductive Medicine (by rigorous testing) if infertility is your issue. Have you tried acupuncture? What were your experiences? Lewis, R. (2004) The Infertility Cure. New York, NY: Little, Brown. Posted by Andrea & filed under Health Tips. This post has 4 comments. So happy to have found your blog, and truly appreciate that you are sharing your experience. I still consider my self overall healthy…..with a series of conditions that am confident are attributed to my gene mutation of A1298C homozygous. Over the last 15 years, I treated many of my symptoms, with diet, vitamins, exercise, herbs, conventional and alternate methods, usually with satisfactory, but temporary results. I am so grateful that I was curious and willing to address my discomforts early and often. Sadly, I continued to fee slower and more tired than I knew I should be……then things started to spiral……endometriosos diagnosis in 2006, hashimotos diagnosis in 2007, panic attacks in 2008, brain tumor (diagnosed and removed) 2009, recovery, recovery, recovery…..migraines, uterine fibroids and a positive homozygous A1298C in 2013……..pause…..through all of this….. I have worked hard to keep a positive attitude, and as I continue to am peel back the layers of the onion, I started seeing an accupuncturist, I work closing with my endocrinologist, internist and gynocologist. I am more determined then ever to keep getting healthier day by day. I have started treating my MTHFR with supplements, and am in day 5…! Thanks so much for sharing your story, Michele! I’m so sorry to hear that you’ve had such a difficult time. Being positive and proactive is so important. Have you looked into any other root causes for your health issues? I don’t know whether MTHFR is always *all* to blame but it certainly does complicate and contribute to health problems. Wishing you all the best on your journey and I hope that some of the topics covered here are helpful to you. I also hope that treating your MTHFR gene mutations with supplementation helps you. Please also think about exploring other SNPs that could be causing issues through genetic testing. Thank you so much for the wonderful shout out! I can’t tell you how much joy my heart is filled with that TCM has made such an incredible impact on your life. It’s such a powerful medicine!!! I am not a doctor and THIS BLOG DOES NOT PROVIDE MEDICAL ADVICE. This site is about my own healing journey. If you know or believe that you have a MTHFR mutation, hypothyroidism or other health problems, please get yourself tested and find a doctor or natural health practitioner who is willing to help you find the root cause and develop a personalized treatment plan for your particular body. This site is provided for informational purposes only, and the content is not intended as a substitute for professional medical advice, diagnosis, or treatment. Always seek the advice of your physician or other qualified healthcare provider for answers to any questions you may have regarding a medical or health related condition. The content here is not intended to be relied upon for medical diagnosis or treatment. Always consult a health professional before making dramatic changes to your diet or lifestyle and before taking supplements. You are ultimately responsible for your own health. Reliance on this website and its content is solely at your own risk.